I wanted to read this title because I enjoy Old Hollywood fiction, and the premise reminded me a bit of A Touch of Stardust, which I enjoyed. 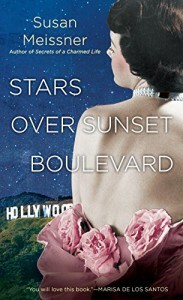 Like that book, Stars Over Sunset Boulevard is set during the filming of Gone With the Wind, but the movie is merely a distant backdrop in the story of two women with different ambitions in the 1930s. Audrey wants to be a "star," more so than being an actress, while Violet longs for a picket fence and family. The progression of their friendship could easily have existed without the GWTW subplot - unlike Kate Alcott's book, there's very little interaction between the film stars and the main book characters. Overall, the book reads rather quickly, but seems to fall short in places. It's not exactly a love triangle story, and you might lose sympathy for one character in the story due to her meddling and manipulation of her friend and the gentleman in question. I suppose I had expected something different in the story.